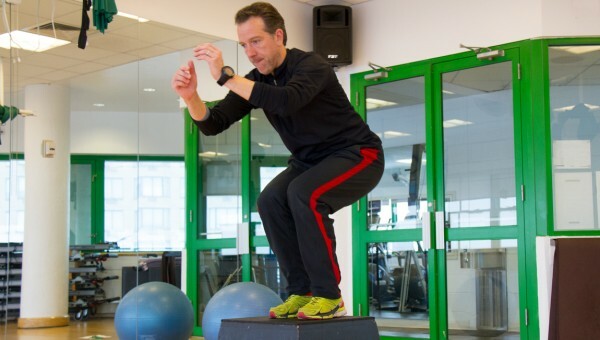 Asphalt Green Triathlon Club Head Coach Mikael Hanson shares his secrets to a stronger core. Stay tuned for more tips from our top fitness staff in our monthly Get Fit blog series. Strong core muscles are about more than six-pack abs. Your core serves as your body’s center of gravity, supporting all muscles. (You even use these muscles while sitting at your desk.) Whether you’re a seasoned triathlete or a beginner exerciser, a strong core is essential to prevent injury and reach your full fitness potential. Mikael Hanson, Asphalt Green Triathlon Club head coach, shares his five favorite exercises that will keep your core strong year round. 1. Seated medicine ball twists: From a seated position, lift legs up and bend knees. Your feet should be hanging about 1 inch from the floor. Take a weighted medicine ball or single dumbbell in both hands and twist, setting the ball down beside each hip. Repeat 15 to 20 times. 2. Plank: On an exercise mat, support yourself on your toes and forearms, making sure your back and legs form a flat plank. Hold for 30 to 60 seconds, then rest for 15 seconds. More advanced exercisers can lift their right arm from the plank position for 10 seconds, then switch and lift their left arm for 10 seconds. This can also be done by lifting alternating legs. Repeat three times. 3. Pushups off stability ball: Lie over the top of a stability ball with the ball at your waist. Walk on your hands until the ball is resting on your shins, then complete one pushup. Walk backward on your hands to starting position. Repeat four to seven times. 4. Stability ball leg curls: Lie on your back with a stability ball under your heels and your legs straight. Carefully lift your hips off the ground, stabilizing your body in a straight plank. Bend your knees, and slowly roll the ball toward your body until your upper and lower legs are at 90 degrees. Pause, then roll the ball back to starting position. Repeat 10 to 15 times. 5. Box Jumps: Choose a box that is 1 to 2 feet tall. Stand on the ground behind the box. Squat as low as you can while using proper form and leap onto the box, swinging your arms forward to gain momentum. Land firmly on the box with your knees bent. Jump backward off the box, making sure your bend your knees upon landing. Repeat 10 times.